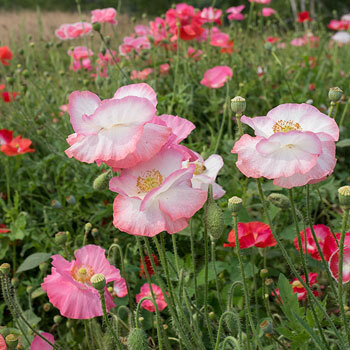 Shirley poppies are named for the English town of their birth, assisted by the meticulous selection of the good Reverend Wilkes, who preferred single poppies of luscious pink, white, coral and more-with no black blotches about! We offer poppies after his own heart, full, frilly and with nary a charcoal stain. Seed grown on our farm!